The blundering Walther during a "business trip." WASHINGTON—Citing his erratic social behaviors, sudden unexplained disappearances, nondescript occupation, and habit of accidentally walking off piers while pretending to read newspapers, acquaintances of 37-year-old Jeff Walther said Thursday they suspect he may be a bumbling spy. 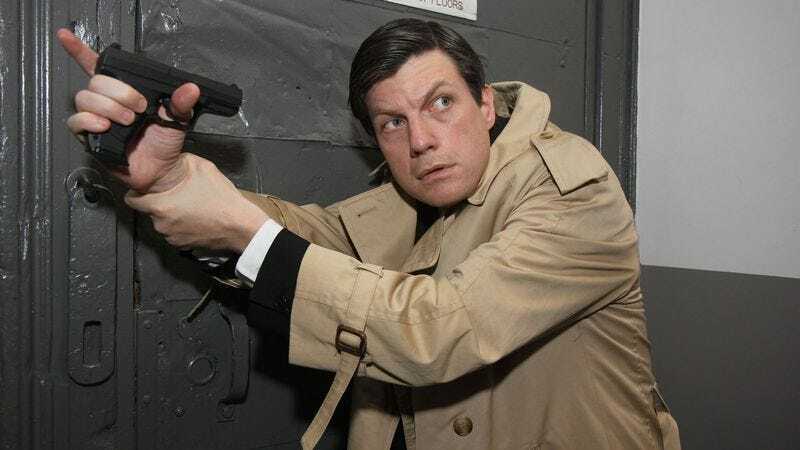 Walther, whose mysterious background and impeccable sense of understated style are reportedly matched only by his utter lack of grace and inability to go an extended period of time without somehow losing his balance, has forced those who know him to conclude he is a specially trained—yet highly inept—secret agent. "Whenever you try to talk to Jeff, his mind seems to be somewhere else, and he's pretty evasive about why he's always abruptly leaving the country for weeks at a time," said Matt Weill, a government contractor who has encountered Walther at social gatherings. "He's constantly fiddling with his belt, and when I ran into him on the street a couple weeks ago, it looked as though he'd just pressed the back of his trench coat against a freshly painted wall." "At this point, I can only assume the guy's some sort of spy," Weill continued. "I don't think he's very good at it, but I'm still pretty sure he's a spy." While a few friends have posited alternative explanations for Walther's strange behavior, often referring to him as a "very private person," most have difficulty accounting for the fact that his clothing always appears to be stuffed full of wires, or for the numerous times Walther has been caught talking loudly into his wristwatch. The terrible spy in action. In the past two months alone, sources confirmed, Walther has been seen spraying himself in the face with ink while using a pen, running into a lamppost and immediately jumping into a karate stance, and, on two separate occasions, abruptly leaving a dinner party only to turn up an hour later soaking wet and sputtering water with a live fish flopping around in his jacket pocket. "I once received a package at my apartment and he immediately grabbed it, threw it into my fish tank, and jumped behind the couch," said longtime friend Sandra Calabrese, who also recounted the times she has seen Walther inexplicably don a fake mustache and speak in a terrible French accent. "When he saw he had ruined a family picture my mother had mailed to me, he came out from hiding and said, 'You can never be too careful these days,' before tripping over my coffee table, flailing wildly across my living room, and attempting to balance himself with my coat rack, which he then destroyed along with the vase on my dining room table when he tried to brace himself with the tablecloth." "I love the guy," Calabrese added, "but it's becoming pretty obvious that he's the worst spy on the planet." Despite repeatedly claiming to work as a "government analyst," Walther has further roused the suspicions of those in his social circle by coming up with strange and outlandish excuses for why he often arrives at places with the legs of his trousers completely shredded and/or emitting smoke. In addition to acquaintances assuming Walther is a terrible spy, proprietors of several local businesses told reporters he has caused thousands of dollars in property damage during what appeared to be bungled covert operations. "I personally witnessed him set the drapes in my banquet hall ablaze after he attempted to suavely light a beautiful woman's cigarette and then threw the match over his shoulder," said Four Seasons Hotel manager David Gilbert, who oversees many lavish Washington parties thrown for visiting foreign dignitaries, to which Walther somehow always gains access without having been invited. "Another time, while wearing a tuxedo similar to our staff's uniform, he threw a white cloth over his arm and tried to pretend he was a waiter, but then walked the wrong way through the kitchen door and knocked over eight servers carrying full trays of food and champagne." "On both occasions, he seemed to have some sort of dart stuck in his neck by the time security caught up with him and tossed him down the front steps of the hotel," Gilbert added. While Walther declined to comment on accusations he is a bumbling government agent, he later said he wanted to reassure readers he is in fact "a fully trained spy," and then stated, "Whoops, that's not at all what [he] meant to say," before attempting to steal the reporter's tape recorder.